At the weekend and on Friday registry offices are overcrowded: one pair of newlyweds are replaced by others, not the output do not stop screaming "Bitter" and congratulations. Solemn registration of marriage - a very magnificent event. The sounds of the wedding march, executed a brass band, a young couple coming to the institution staff. Here they will hear and say exciting, long-awaited word "Yes", to exchange rings, kiss to seal relationships and signatures. These minutes give a memorable, joyful emotions. Later, the young are invited to a private room,where they put their paintings. 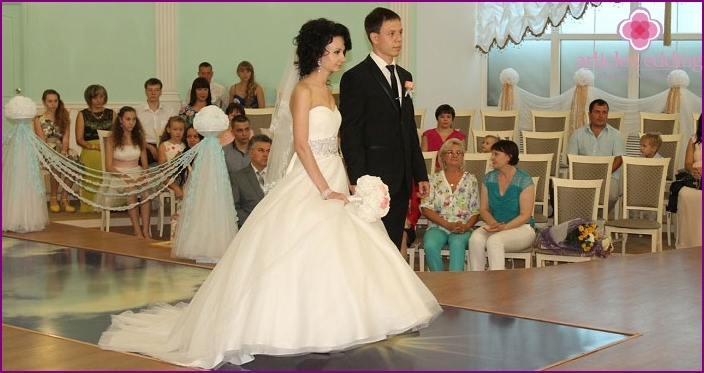 If additional services such as a photographer registry office, for a wedding dance music, order them at this time for the official registration of marriage ceremony you need. Then the couple will need to wait a bit, along with relatives and friends. The number of allowed guests at the ceremony depends on the size of the hall. This issue should be discussed with an employee of the institution. 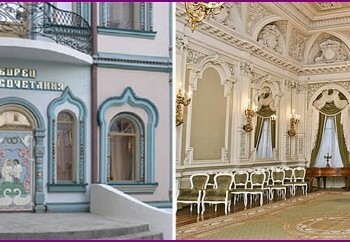 Before the beginning of the marriage registration department employeerecording acts briefly explain to you a present guests when it is necessary to enter the hall, where to go, where to stay. Hall for the ceremony is a spacious room with a luxurious interior Baroque or Classical, with a small orchestra, rows of chairs for guests registrar table. An employee of the registrar to build a column: the first will be the bride and groom after - witnesses behind them - the parents and guests. The sounds of the wedding march in the reception areaincludes the couple and witnesses. It is better to rehearse this moment, a few days before the date fixed for the wedding ceremony. Remember that the bride is on the left side of the groom and bride, in turn, leads young arm. The witness is next to the groom, and the witness - with the bride. The couple stopped about two meters from the place where is the manager table. Then you have to listen carefully, to answer questions and not get lost. The registrar says for a young couple a long,beautiful, very moving speech, timed the creation of a new unit of society, the family. When he asks the bride and groom on whether they agree to marry each other. When the young couple confirmed their intentions, the registrar declares them husband and wife. After the exchange of rings, which gives witness. Registrar shall permit the husband to kiss his wife, invited guests applaud loudly. It takes more to deliver the painting to record acts of civil status, in duplicate. When the state registration of the marriage is over,declared the first dance of a young couple. It is necessary to rehearse in advance, and sometimes learn the dance with a special coach. It can be a slow waltz or normal composition. Next, the manager announces that all the participants can express their congratulations to the newlyweds. Had agreed with witnesses that they took all the flowers, the couple will be uncomfortable to leave the institution with a complete bunch of flowers. After congratulations sounded arrangedsmall buffet: chocolates, champagne, tartlets, snack sandwiches. Carry with them the table is not necessary, give all guests plastic cups and snack spread out on trays or the hood of a car. Do not forget the kids, get them to a special children's champagne. On this solemn marriage registration is over, and the young can go ride around the city, photographed. How much is the solemn registration of marriage in the registry office? 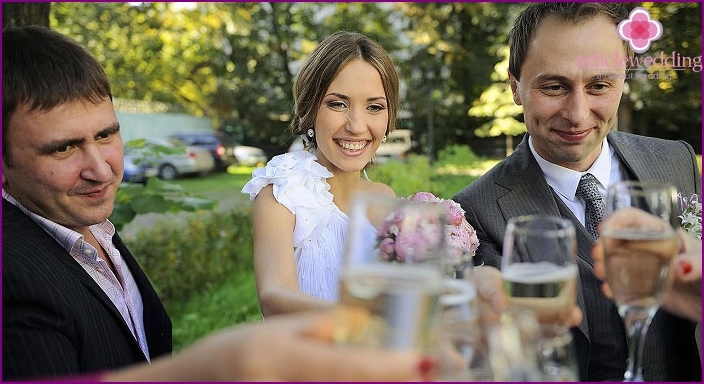 The state duty for marriage registrationRegistry office is 350 rubles. Also you need to pay for the solemn rite, a local photographer, orchestra services, for the crust of the marriage certificate. In most cases, this amount does not exceed the 4,000 rubles. The final cost in different cities may vary slightly. The state fee is payable to the Savings Bank of Russia terminals. How nice it looks magnificent ceremony whenYoung graceful waltz go under Mendelssohn, dated to listen about this question, saying to each other, "Yes." Next, the pair exchanged rings and drinks fizzy drink. Then the young in more than a relaxed state give smiles and kisses, take sincere congratulations and photos sent to walk in a new role. Is not that the dream of every girl who found her prince? Visually examine all the charm, touching moment of registration of marriage in the registry office you can in the video below. 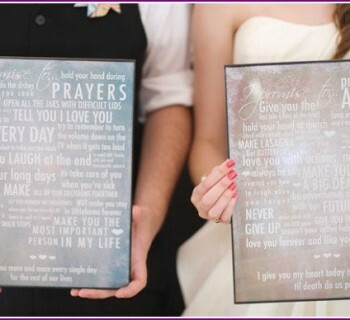 What to give for a wedding?